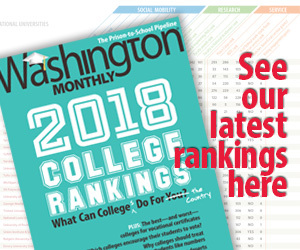 Washington Monthly | Are Schools Ignoring Tough Decisions? Are Schools Ignoring Tough Decisions? However, generally absent from cost containment and revenue sustainability decisions are cost reallocation decisions regarding the relevance and viability of the academic portfolio. The extent to which institutions explore the financial performance, market demand and mission impact of academic programs (e.g., programs, concentrations, courses, sections) across the program portfolio is largely unknown. It is unclear if institutions have a structured process, access to the data and reporting mechanisms to inform review of programs and, subsequently, if they have the capacity to make decisions to retire/eliminate programs. Given the significant resources allocated to academic programs, the time many programs have been in existence, and the changing market place and challenging economic conditions, a rigorous, objective review is a reasonable and necessary part of an institution’s due diligence. This goes back to a major, nettlesome question that is always lurking around the edges of the higher education world, but which has taken on an added urgency because of the recession: To what extent can colleges afford to offer learning just for the sake of learning, without taking into account the business side of things? Mann asks whether the “traditions, political forces, mission arguments and ideological posturing within the academy [are] trumping the ability to restructure the academic portfolio,” which is both a fair question and one that academics can fairly cringe at hearing.